Canada’s second Mixed Doubles Trials swung into action this evening at the prestigious Ottawa Hunt and Golf Club. The 2014 version of this championship features 32 quality teams, with many coming from their Provincial and Territorial Play-downs. All but two areas of the country are represented. The remaining teams were selected via the CTRS process to produce this excellent field. At the Team Meeting on Wednesday evening, three individuals were recognized by the teams and officials. Robert Desjardins, last year’s champion is here with a different teammate this year. 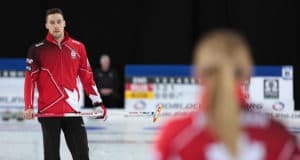 John Morris was recognized for his outstanding performance with Team Cotter at the Tim Hortons Brier in Kamloops, B.C., and of course, Kaitlyn Lawes was a hit following her Olympic gold-medal win in Sochi, Russia. 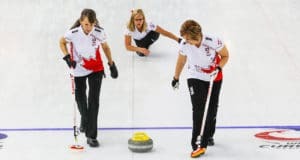 This is a highly skilled group of curlers. The event should produce a championship team that will challenge for a medal in Dumfries, Scotland later in April. 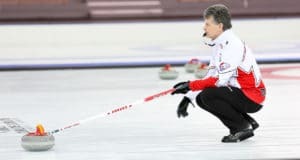 The Mixed Doubles Championship will be paired with the World Seniors Championship, creating the largest group of curlers playing for World titles in one location, anywhere in the world. Since its initial year of participation in 2008, Canada has won only one medal: bronze won by Sean Grassie and Alison Nimik. Since then Canada has been shut out. Perhaps this year will yield our second medal performance. But we will have to be better than good to medal. The Europeans know and understand this mixed doubles format and play it exceptionally well. Hungary won over Switzerland last year in Saint John, New Brunswick. Canada was not in the hunt when playoffs started. Two draws are scheduled Wednesday evening with several highlight games. These matches will be the first of seven games for each team as they play their way through their pool of eight. The four pools have been ranked to provide equity within each grouping. Twelve teams will go to playoffs starting on Saturday night.